Fr. Provincial, John Michael Rafferty, OAR, was informed at 8:30 this morning (September 8, 2017) by Fr. Frank Wilder, OAR, Associate Pastor of St. Benedict Parish, that Father James D. McGuire, OAR, died early this morning at Rio Hondo Convalescent Hospital in Montebello, California. He was 88 years old. Fr. James was the former Provincial of Saint Augustine Province and former Prior General of the Order of Augustinian Recollects. 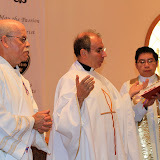 Most recently, he served as an Associate Pastor of Saint Benedict Parish in Montebello, California. Let us pray for the eternal repose of the soul of our brother, Father James D. McGuire, OAR.